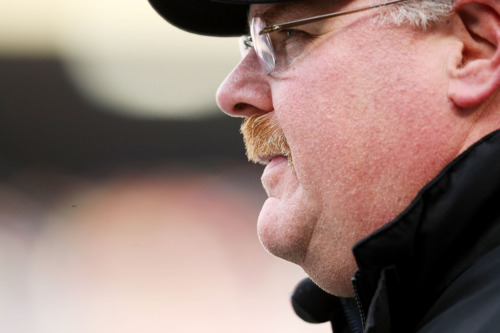 Time for Andy Reid to Move On? As an up and coming assistant coach on Mike Holmgren’s staff, Reid saw that his mentor kept a notebook with everything from basic football philosophy to detailed notes on training camps schedules. At some point Holmgren’s notes outgrew his notebook, so he copied it into a new form and threw away the old one. Reid plucked it out of the trash. By the time he was interviewing for the head coaching job in Philadelphia, Reid’s binder had ballooned to six inches thick. All that detail, all that preparation before he ever had a top job. It was impressive to say the least. And, like the Reid we know today who still hasn’t lost a game after the bye, he didn’t let that preparation go to waste. Reid took over a moribund team and transformed it, improving it each year for six straight years. He found the right quarterback, hired the right assistants, drafted well, and made smart free agent acquisitions. 5-11, 11-5, 11-5, 12-4, 12-4, 13-3. Four straight NFC Championship games, one Super Bowl appearance. It was masterful, if ultimately incomplete. The binder full of notes worked almost to perfection during those first six seasons. But six seasons later, I wonder how much of that binder is left. It’s doubtful that Reid ever had a plan for what to do after the climax of 2004. Since then, he’s mostly been spinning his wheels. Keeping an NFL team competitive this long is very difficult, but Reid and company have managed. They’ve kept the team at or above .500 every year after 2005 and reached the playoffs four times. But the team also hasn’t improved during that span. Some of the same problems remain, some have changed, but at the end of the day Reid hasn’t lived up to the standard of constant improvement he set in his first six seasons. That’s certainly better than never having a shot, but continuity also implies a certain complacency and stagnation. The Eagles of the first half of Reid’s tenure marched forward relentlessly, like a man who pushes himself a mile further each day, intent on completing a marathon. Those Eagles didn’t have continuity, they were aggressively ascending. Those Eagles were like an army growing in strength and resolve as it approached its target. Today’s team seems to have set up camp outside the enemy’s capital, in the sixth year of a siege that shows no sign of ending. Sometimes they launch an attack, sometimes they just sit and wait. They’re always close to taking the city, but the progress and the urgency is gone. I’ve long been a supporter of Reid, and I still believe he can win the Super Bowl. But the road doesn’t get easier as you stay in the job longer and that urgency slips away. He may have missed his window in Philadelphia. 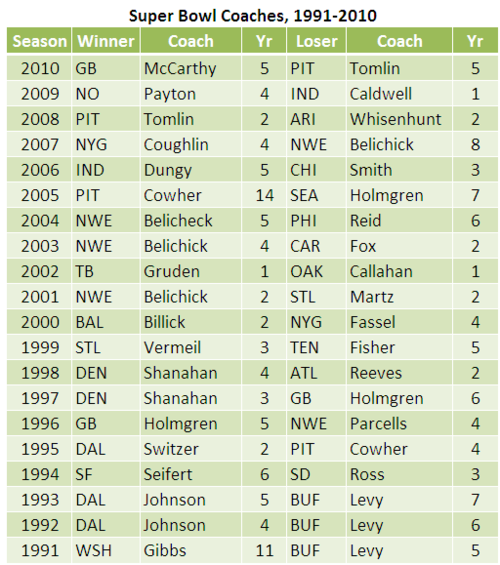 Look at the list of Super Bowl coaches over the last 20 years. They average just 4.3 seasons of tenure as the head coach of their team. Only Bill Cowher and Joe Gibbs have managed to win it all after their 6th season. To some degree there’s a bias here, because coaches don’t often last much beyond their 6th season, if they make it that far. But list the longest tenured coaches and you don’t see many Cowhers. Andy Reid, Jeff Fisher, Brian Billick, John Fox. They last and they last and ultimately never find that elusive second chance. Whether that’s because they lose their edge, because their can’t find the right personnel, or because they can’t replace coaching talent, I don’t know. The Eagles front office has bungled the 2011 season in multiple ways. With better coaching and one or two different acquisitions, maybe they’re off to a 4-0 start. But perhaps those mistakes aren’t one-off blunders. Perhaps they are indicative of a franchise that’s been running in place for six years. And if that’s the case, it’s probably time to clean house and start over. Tagged with Philadelphia Eagles, NFL, Coaching, Head Coach, Super Bowl, Mike Holmgren, Winning, Success, Bill Cowher, Joe Gibbs, Front Office. October 4, 2011 by Brian Solomon.